AC Adapter - SHIPS FREE! 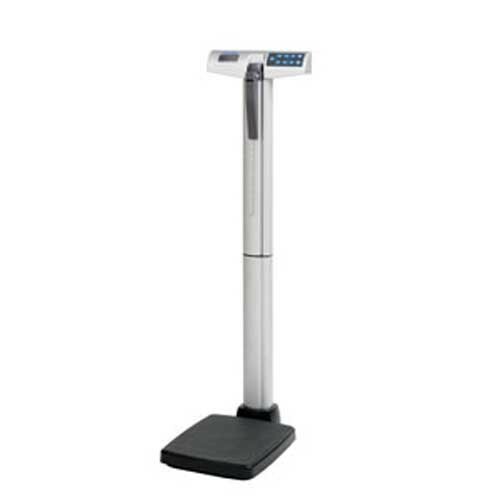 The Health O Meter Physician Digital Scale is professional grade and features a 500 lb (227 kg) weight capacity that is measurable in 0.2 lb (0.1 kg) increments. The scale itself measures 14" x 16.7" x 53.6" and features a 14" x 16.7" platform. The vertical pillar is made of high quality aluminium topped with an Easy to Read 1" high LCD display. EMR connectivity is available through USB and BMI (Easy Scroll Method) comes standard with the scale. A durable height rod that will adjust from 24" - 84" and measures 1/8" across is also standard with the scale. The scale uses a 120V AC adapter (sold separately) and can be battery operated with 6 AA cell batteries (not included). The platform has a non-skid mat for extra stability and easy access. Please feel free to download the Full Product Manual here. Some assembly required.